We meet for worship every Sunday morning at 11 am. Services are usually led by our minister, Revd Paul Martin. Worship at Trinity is designed to help people meet with God in a warm and friendly atmosphere, and to challenge people to think about the impact of the good news of Jesus on every aspect of their lives. The texts of recent sermons are available if you click on the link on the left hand side of this page. The themes of services in the current month are shown below. We celebrate Holy Communion on the first and third Sundays of the month. All who seek to follow Jesus (regardless of what Christian tradition you are from) are welcome to share the bread and the wine with us. On the first Sunday of each month during the service we invite members of the congregation to light a candle for anyone known to them who is in need of God’s help and healing. We always serve tea, coffee and biscuits in ‘the concourse’ after the service and hope that all will join us. As a church we are committed to ‘Fair Trade’ and there is usually also a Traidcraft stall after the service selling various Fairly Traded goods. Our buildings are fully accessible for those with disabilities, including the provision of accessible toilet facilities. Large print versions of the hymns are available. Within the sanctuary there is a loop system for those using hearing aids. There are baby-changing facilities for parents with young children. 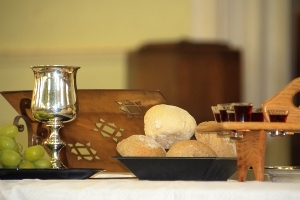 When we serve communion, a gluten-free alternative to the bread is available.